In this project, we will emphasize interpreting circuit schematics and creating the corresponding physical circuits. Our circuit schematics will be for what are called lumped-parameters circuits; this simply means that our circuits are all created from idealized components which are connected by perfect conductors. In order to implement our circuits, we will also need to be able to identify nodes in the circuit—nodes simply correspond to single points in the circuit, electrically speaking. Confusion sometimes arises since the concept of an electrical point in a circuit is not necessarily the same thing as a single physical point; electrical nodes can be “spread out” by perfect conductors. For this project, we will be using some components that we have seen from previous sections: voltage sources and resistors. However, we will give less guidance on exactly how to implement these components. For example, you will be expected to choose how to implement the required voltage source and you will need to find resistors in your parts kit corresponding to desired resistance values. Some additional information relative to the representation of sources in circuit schematics and reading color codes on resistors is provided at the links to the right. One issue associated with implementing electrical circuits is whether the physical circuit actually corresponds to the one in the schematic—it is always possible that there is an error in the implementation, which results in testing a completely different circuit than what was intended. In order to ensure that we've actually created the desired circuit, we will need to measure some voltages and/or currents1. 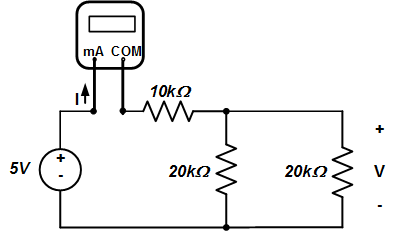 Expected values for these voltages and currents are provided in this project; if your measured values agree with the given values, you can be reasonably certain that your circuit is correct. Draw the circuit symbol for an ideal voltage source and state what is known about the current delivered by an ideal voltage source. Be able to identify nodes from an electrical circuit schematic. Be able to state how the holes in a solderless breadboard are connected. 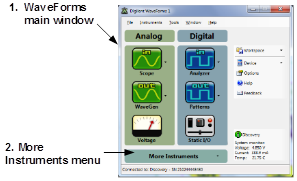 Be able to use the Analog Discovery™ voltage instrument and the waveform generator to apply constant voltages. Be able to use the Analog Discovery voltmeter instrument. Be able to use a DMM to measure constant currents. Be able to create a physical circuit with a single source from a schematic. Be able to complete the Problem challenges at the end of this exercise. In order to measure the current I, we need to re-configure the circuit to put the ammeter in line with the 10kΩ resistor. 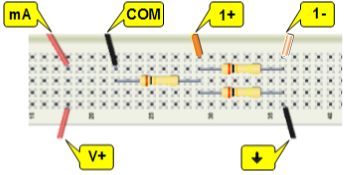 Label nodes (A, B, C, D) as points that connect two or more circuit components. V+ and the DMM's µA mA terminal are at node A. The 10kΩ resistor, the 1+ connector, and both 20kΩ resistors are at node C.
The 1- connector, both 20kΩ resistors, and the Analog Discovery ground are connected at node D.
Your measured voltage should be approximately 2.5V. Your measured current should be approximately 0.25mA. Try reversing the polarity on your voltage measurement (just interchange the terminals). This should just change the sign on the displayed number. 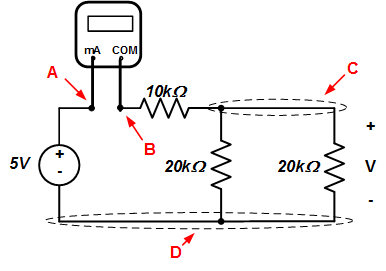 Use your DMM to measure the current through either of the 20kΩ resistors. You will need to reconfigure your circuit slightly in order to insert the DMM properly. Your measured current should be about 1.25mA. If you are confident in your ability to build single source circuits from a schematic and would like some extra practice, we have provided a few problems in the links below. These problems require that you understand the concepts introduced throughout this exercise. 1As engineers, we normally do a mathematical analysis to determine what performance to expect. The comparison between the expected and actual circuit behavior then helps us decide whether we've built our circuit correctly. In this project, however, we want to emphasize circuit implementation, rather than analysis. Plus, we may not have a ton of experience in the analysis of electrical circuit. Hence, the expected behavior is given.